Apple has officially released iOS 7.1.2 Firmware (Build: 11D257) for iPhone, iPad, iPod Touch and Apple TV 6.2 Software Update (Build: 11D257c) for Apple TV 3G/2G devices. The latest available update contains several bug fixes, improvements, addition of new features and functionality. 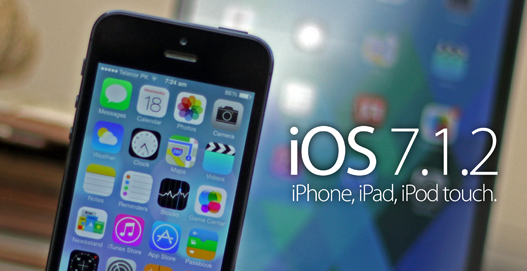 Apple iDevice users can Download iOS 7.1.2 Firmware Final IPSW for iPhone 5S, iPhone 5C, iPhone 5, iPhone 4S, iPhone 4, iPod Touch 5G, iPad Air 5G, iPad 4G, iPad Mini, iPad Mini 2, iPad 3G, iPad 2G and Apple TV 3G/2G via Direct Links shared below. Apple has added major security updates and bug fixes i.e. iBeacon connectivity improvements and stability, fixes for bar code scanners, Mail attachments fixes and improvements etc. You can read more in below image of iOS 7.1.2 Changelog. Those iPhone, iPad, iPod Touch and Apple TV users running an old iOS 7.1.1 firmware can upgrade/update to latest iOS 7.1.2 firmware via OTA (Over-the-Air) process, by simply navigate to Settings > General > Software Update option. For manual installation of iOS 7.1.2 Firmware via iTunes, The official Direct Download Links of iOS 7.1.2 IPSW Firmwares for iPad Air 5G, iPad 4G, iPad Mini, iPad Mini 2, iPad 3G, iPad 2G,iPhone 5S, iPhone 5C, iPhone 5, iPhone 4S, iPhone 4, iPod Touch 5G and Apple TV 3G/2G is posted below. The Untethered iOS 7.1.2 Jailbreak Using Pangu for iPhone, iPad and iPod Touch on Mac OS X and Windows operating systems is also available HERE. No Evasi0n7 Jailbreak Tool offered by 'Evad3rs' yet.